Jaylen is the son of Katrina Davila and RJ Ortiz. Jaylen is in kindergarten at Faulk Early Childhood. In his spare time, Jaylen enjoys riding his bike. He also likes to play with his brother, Brendan and sisters, Ava and Kiana. Jaylen likes school because he gets to learn his numbers, use his favorite color blue, and go outside to play. When Jaylen grows up, he wants to be a fire fighter. Jaylen was selected as “Panther of the Month” because he is a dedicated student. He follows the schools’ rules and tries his best when doing his work. Jaylen is a good helper to his classmates and his teacher. Faulk Early Childhood is proud to have Jaylen Davila as their Panther of the Month. 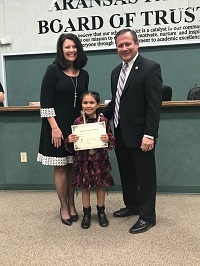 Andrea is the daughter of Silvia Briones and Roland Aguilar and is a 3rd grader at W. A. Kieberger Elementary. In her spare time, Andrea enjoys playing outside, reading, and helping her mom. Andrea likes science best of all her classes because we do such cool stuff in that class. Currently, Andrea is not sure of what she wants to be when she grows up. Andrea was selected as the "Panther of the Month" because she is a very caring hard working student. She makes great choices at school. Andrea is a leader when it comes to academics. She has a sweet smile and a caring personality for everyone. Andrea was nominated as POM by her teachers. 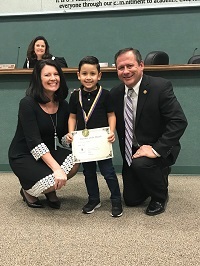 Kieberger Elementary is proud to have Andrea Aguilar as their January Panther of the Month. Eli is a fourth grader at CMES. He is the son of Clint and Celeste Stansberry. Eli has three sisters. He currently has two guinea pigs and two dogs. Eli's favorite hobbies are playing the video game Fortnite and playing soccer. Eli's favorite color is orange and his favorite subjects in school are reading and science. He likes school because he can learn and be with his friends. When Eli grows up, he wants to become a professional chef and a professional soccer player. Eli was selected as “Panther of the Month” because he is always respectful and always puts others first. We are very proud of his hard work and dedication. Please join us in congratulating Eli Stansberry. 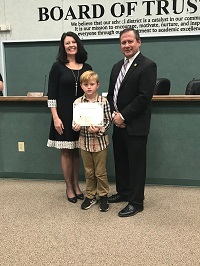 He is one of the many bright stars we have at Charlie Marshall Elementary School. Jesus is 6th grade student at A. C. Blunt Middle School. He is the son of Jose and Alma Rodriguez. Jesus is the youngest of three children. He has a brother named Jose Jr. and a sister named Jackie. In his free time, he likes playing video games and reading. Jesus likes to read adventure and mystery books. His favorite books are the Goosebumps series. Math is his favorite subject because finding the answer is like solving a puzzle. When he finishes school, he is interested in pursuing a career in law. This interest comes from his enjoyment of the television show, Law and Order. Something that might surprise others about Jesus is that he knows how to cook. Jesus Rodriguez was selected as “Panther of the Month” because he is a dedicated student. He was nominated by her teachers because he always follows the rules, makes good choices, and is a good example for fellow classmates. 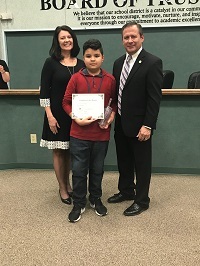 A.C. Blunt Middle School is proud to have Jesus Rodriguez as their Panther of the Month. Kaylyn is the daughter of Denise and James Hollan. Kaylyn is a junior at Aransas Pass and enjoys Varsity Cheerleading in her spare time. Kaylyn loves taking care of her kitten, Luna. 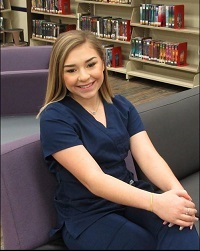 Her favorite subject is math and her goal is to become a Pediatric Nurse when she graduate for college. Kaylyn was selected Panther of the month at Aransas Pass High School because of the hard work and dedication she exhibits. Aransas Pass High School is proud to have such a great student.